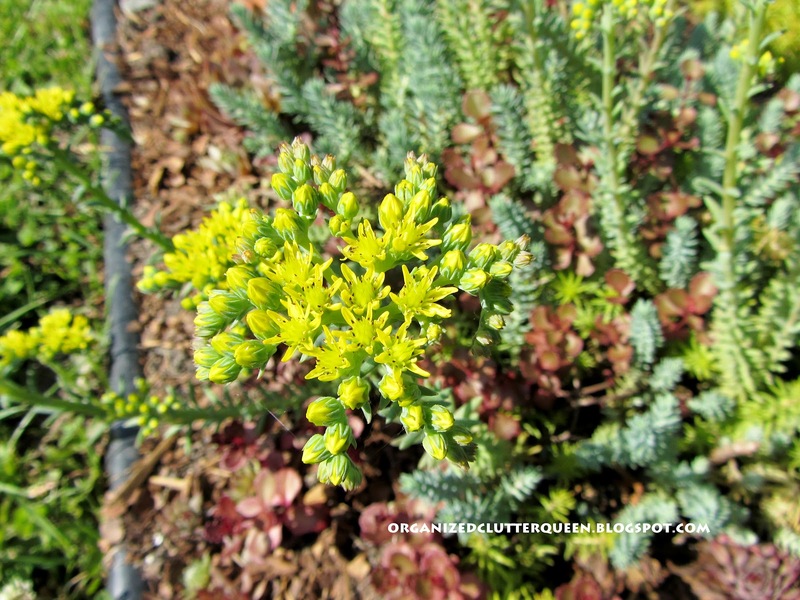 I am a sedum lover. 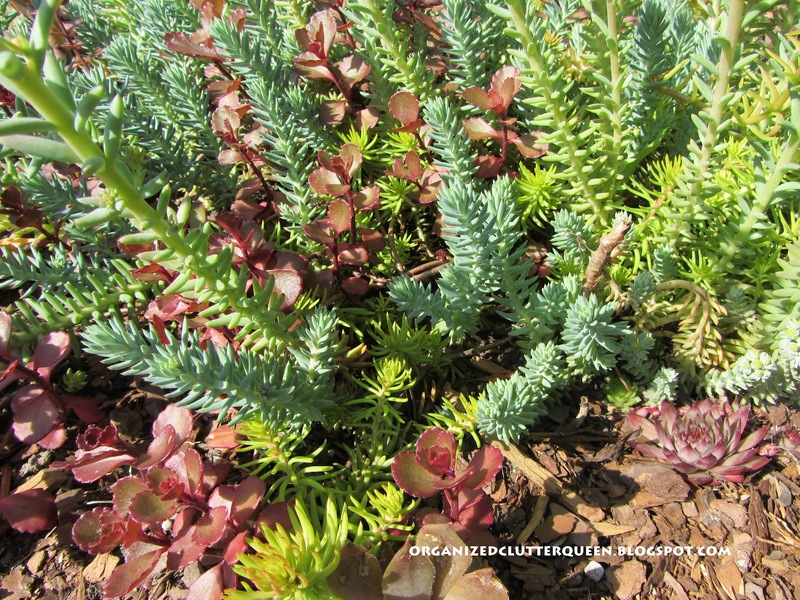 My favorites are the sprawling and creeping types. The uprights, like Autumn Joy, just plain bloom too late in the autumn for me. 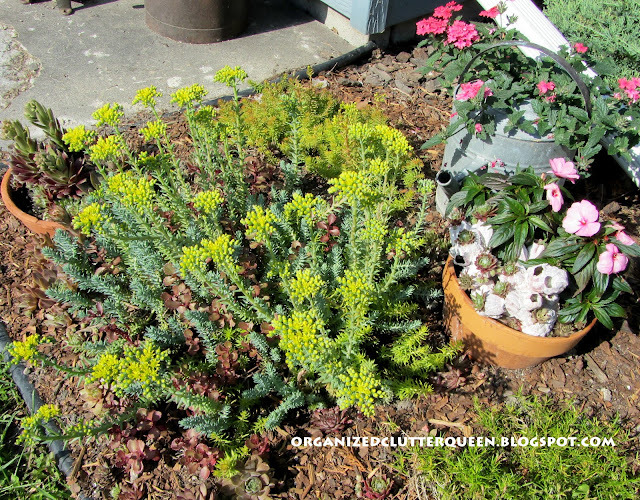 Usually most of my annuals have been killed by frost, and they are the only plants blooming. A few years ago I purchased my favorite sedums called the "Flaming Carpet Sedum". The pot arrives (this was one pot) with three sedums, Angelina, Blue Spruce and Voodoo, all planted together. 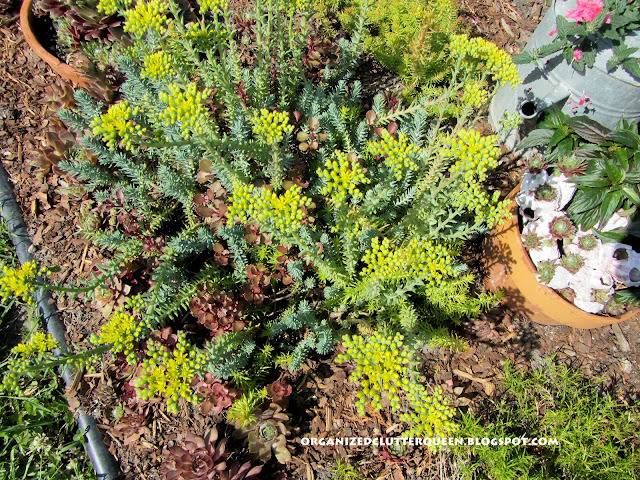 When it grows, it is a fabulous mixture of colors and textures. 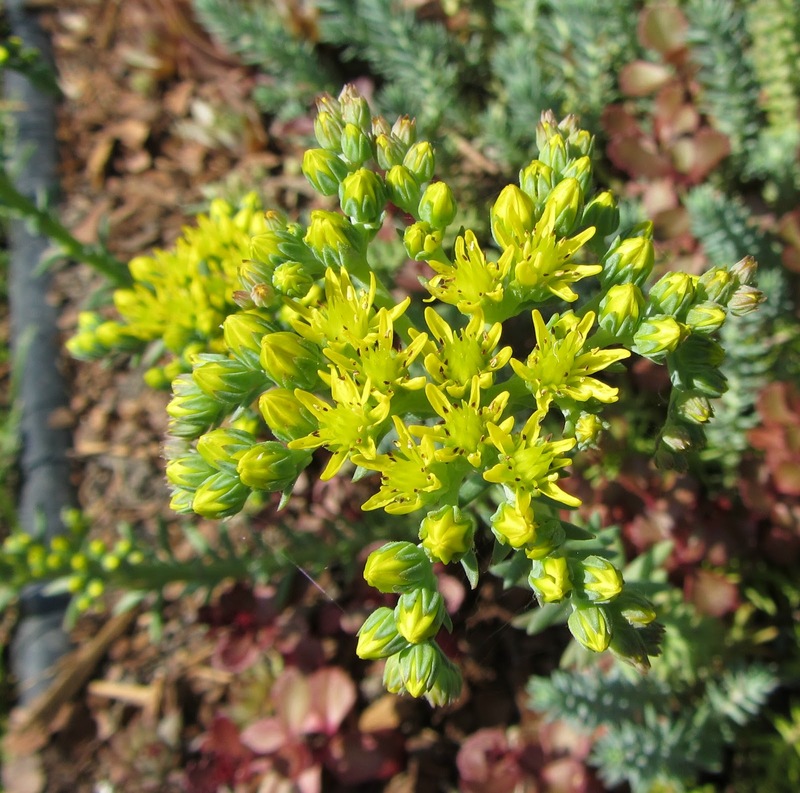 The Angelina sedum has just started to bloom. 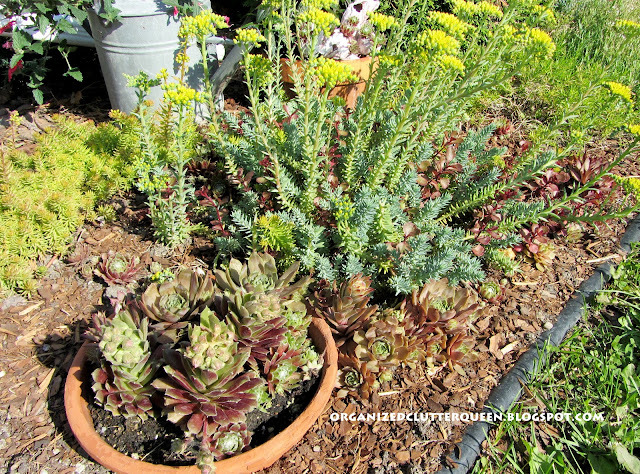 I have mixed hen and chicks in with the sedums and added mulch. Love the colors! 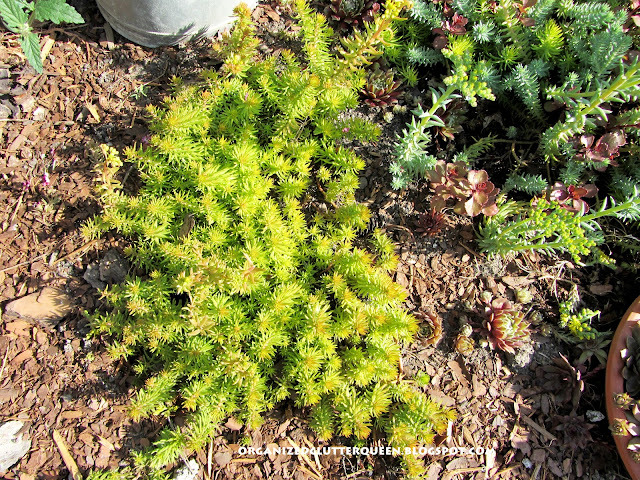 My hen and chicks in barnacles are next to the flaming carpet sedums. If you are interested in purchasing a Flaming Carpet sedum medley here is the link. Your collection of succulents is lovely! Thanks for welcoming me back. I look forward to seeing you for Potpourri Friday! Like the contrasting colors. I may have to check into sedums. How are they in hot, humid weather? 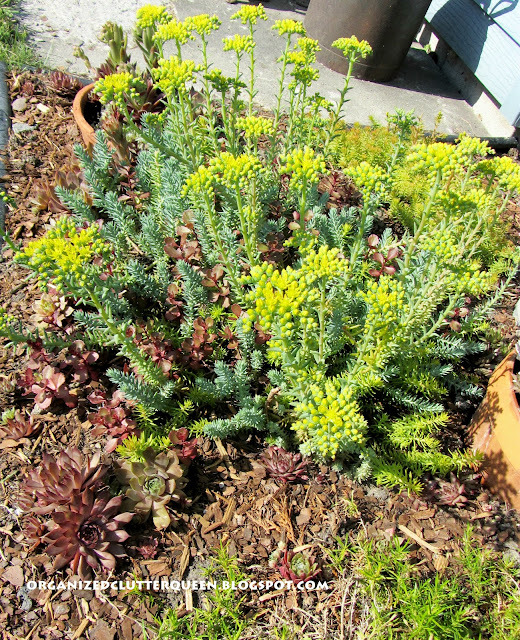 My sedum is just not making any progress. It looks the same as it did when I put it in the ground back in February. Now the one I actually put in a pot...it is going crazy! Go figure. Love the three together!!! I have many sedums too. I have the Voodoo and Angelina in several planters all over the place. Mine stay out all year long. They are fun. 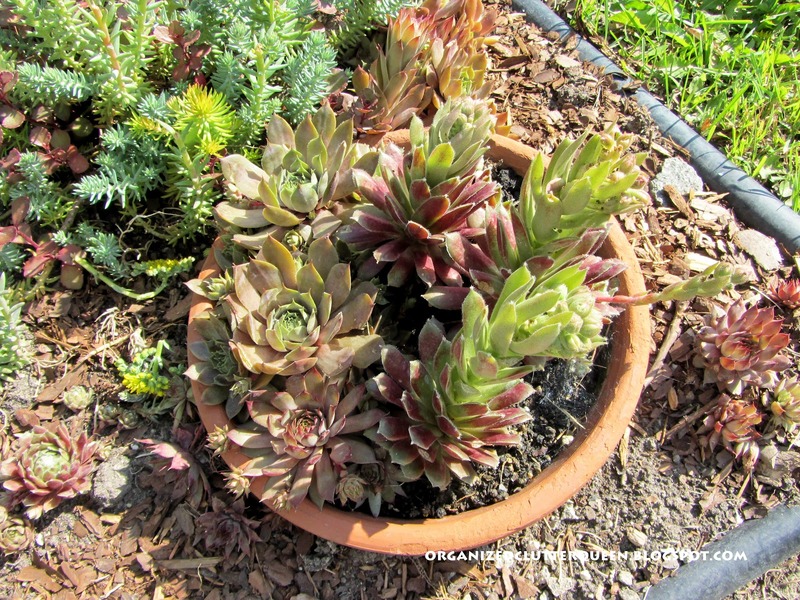 Did you know that your plate, kitchen garden was featured on Home Talk on Face Book. I thought hey that's my friend's garden. COngratulations. My hens are over a foot long this year (and a bit ugly because of it) - any reason why this happened? A few feet away are some other hens and chicks and they are normal size! hi Carlene! What gorgeous gardens you have. Mine are looking pretty darn sad right about now. I have a terrible black thumb! Hi Carlene, thanks for stopping by and your nice comments. WOW, I am impressed with your sedum bed. SO clean and neat, nice variety too. Receber sua visita será uma surpresa maravilhosa. Gostaria que também seguisse o meu espaço que, a partir de hoje torna-se extensão de sua casa, para minha alegria. I am loving them even more now that I am in the South where everything else wimps out when it gets really hot and it is already REALLY hot! LOL! Thanks for the link cuz I was already thinking of asking you and you read my mind! They are gorgeous....what kind of bloom does the hen and chicks get? I have one this year and one sedum like the blue green one you have. It's a start! LOL!